1. Enid Blyton: The quintessential children`s writer, she is author to a number of favorites including the Famous Five and Secret Seven series. She uses simple and easy language, and the fun and mystery quotient in her books stirs up the children`s imagination, keeping them engaged. 2. Aesop`s Fables: The most memorable stories ever told, the Aesop`s fables are a great combination of fact and fiction, neatly tied together with a moral. Most of the central characters in these stories are animals and make for a very interesting read. 3. The Classics: Gone with the Wind, Robinson Crusoe and Dr. Jekyll & Mr. Hyde are just a few names that never seem to fade! These stories, with their old world charm, have the power to engulf readers` and their imagination and take them on a magical journey to far off worlds. 4. Short Story Collections: Earnest Hemingway, D H Lawrence, Anton Chekov, Maxim Gorky, O Henry, and Saki are some of the authors who weave wonderful tales rather simplistically. Pick up collections of these authors for slightly older children and discuss with them the moral of the stories for their better understanding. 5. Fantasy Writing: Perhaps the best genre that children latch on to, fiction writing can help children`s minds grow at any age. With the crux of this writing being objects that talk and tell stories, these books can spark a train of thought and expand imagination. Pick up the Wishing Tree series for starters for your little creative genius. By forcing your children to study, you will instill fear and hatred in their little minds towards academics. Instead, inculcate an interest for studies in them by making the process of learning fun-filled so that they do not perceive it as a boring and a meticulous task. If you watch TV the whole day, expecting your child not to vegetate in front of TV and study is asking for too much. If you do not read, inculcating an interest for reading in your child is going to be a distant dream. In short, your child is likely to follow into your foot steps and inculcate habits similar to yours. So it is up to you to create an ambience best suited for your child. You must understand that not every child has the mental caliber or the inclination to excel in studies. 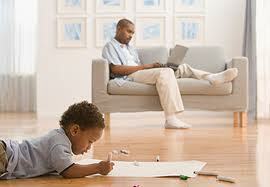 As a parent, you need to realize your child’s potential, liabilities and limitations, and expect the best within that. Constantly comparing their grades with other children and rebuking them for not being up to the mark is the worst humiliation you can put your children through. Even worse is comparison between siblings. This often leads to perpetual severing of ties between siblings and also affects the self-esteem of the child being admonished. The world today has opened up and has grown far beyond the confines of just academically oriented careers. So if you notice that your child has a special skill, interest or flair, like painting, acting, singing, sports or any other, you must encourage him/her to grow and excel in that. Be sensitive to your little stars needs and they will fill the world with their bright luster. As a parent, one must take pro-active steps to kindle one’s child’s	curiosity, which subsequently will sharpen his/her intellect. Sometimes	children can be lazy, but as a parent there is a lot you can do to improve	their interest in academics and the world around them. Encourage your child to collect odds and ends like leaves, rocks, shells, tiny bugs (no place for	giant toads please!) and introduce them to other ‘interesting’ living	species of the planet. This is a way to familiarize the child with its environment and will go a long way in helping him/her understand and learn subjects better. Another way to pep up a study session is to introduce the child to specialties of various regions. For instance, rugs are the specialty of Iran, spices that of India, coffee is the specialty of Brazil, etc. This way the child’s retention capacity is widened as he can identify	places and their importance more easily. Also encourage your child to read alot, be it fiction, travelogues or non-fiction. Nothing broadens a child’s already imaginative mind like books. For a parent, it is most important to remember that academics and text books	are not necessarily the only or the best tools to give a child a good education. Develop an interest in the world around you and you will automatically pass this on to your child. The real world can teach a child lessons he may never learn in school. It is important that the child takes pride in what s/he is doing and not get disheartened by small failures. Help the child look at him/herself from an objective perspective. Encourage the child to write a book about him/herself, which enumerates qualities and drawbacks. What is important here is that the child should be taught to be honest about himself instead of trying to put a veil over drawbacks or hype up virtues. Allow the child to know more about him/herself by speaking with seniors and elders in the family. This way even s/he will be aware of the family tree as also learn values and qualities from others that should be emulated. As a parent, one must take pro-active steps to kindle the child’s curiosity, which subsequently will sharpen his/her intellect. Encourage the child to collect odds and ends like leaves, rocks, shells, tiny bugs (no place for giant toads please!) and introduce them to other `interesting’ living species of the planet. This is a way to familiarize the child with its environment and will go a long way in helping him/her understand and learn subjects better. Another way to pep up study session is to introduce the child to specialities of various regions. Eg; Rugs are the specialty of Iran, Spices that of India, Coffee is the specialty of Brazil, etc. This way the child’s retention capacity is widened as he can identify places and their importance more easily.